Nancy Fuller Children’s University has added a Physical Development program. We have invited our parents, grandparents, and community volunteers to be a part of our Outside Classroom Project. Thanks to Koach Karl Dewazien for volunteering his soccer skills with the children. Each group had 20-30 minutes of outside physical activities, which included hands-on, social learning, and peer interaction. As well as building healthy bodies, self-initiation, control, and personal responsibility. Our goal is to inspire imaginations on the playground and children to be able to regulate themselves, alleviate stress, allowing children with behavioral challenges to be able to participate, be relaxed and maintain better construction. What made this soccer activity the greatest, each child had a ball to kick around and be in control of it. All balls were the same size (2) and color. Which made it age appropriated, so if a child lost their ball we didn’t hear “that’s mine” or “I had that color”. Coach Karl knew how to handle his business with every age group! For the 2yrs olds’ coach had them against the wall reaching for the sky and tickling their toes. Following the leader as an airplane and making animal sounds. 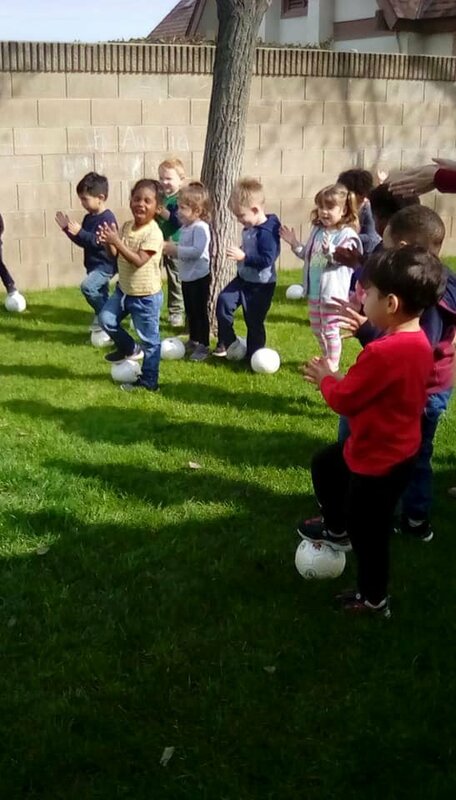 Then came the balls, each child had one to move around, pick it up and put the ball above their heads and down to their tummies. The 3 year olds’ were moving around to get their muscles warmed up by making animal actions, running around the trees and freezing in their spots. While standing against the wall each one got a ball rolled to them. They had to freeze and wait for the next instruction. Now came the fun part, having to kick the ball against the wall, dribbling around the trees, picking up the ball and throwing it against the wall and passing it to the coach. The 4 and 5 year olds’ had the same experiences, but with more challenges. They had to step on the ball and count, dribble the ball around them, and pick up the ball with both feet to catch it with their hands. What a great way to promote the outside project by providing activities that help children develop communication skills and social interaction with peers. With a fast pace growing sport such as soccer in every city, who doesn’t want to kick a ball around? Soccer doesn’t have an age limit as you can see.